Moving into your new home can be an overwhelming task. From the old home to the new home with boxes, movers, furniture and new rooms to worry about, it can be quite a challenge to pack your things and keep track of what is transitioning from one place to another. However with careful organization and preparation, your move can be less stressful than you think. Begin by making a list well in advance of all the things you need to take care of before your move such as collecting boxes and packing materials to having a garage sale or dropping unwanted items off at a local charity. Tie up loose ends and personal business at the bank, doctor’s office, etc. Clarify the moving schedule, especially if you have a long trip ahead of you. Finalize with the moving company how things will be/should be packed. Organize your belongings by rooms, clearly marking each box. Leave possessions in their rooms so nothing gets mixed up with the movers begin packing the truck. Your toss items should be tossed in the trash as soon as you are certain you do not want to keep them and no one else can use them. There is no sense in keeping this stuff around when it will only be in your way. Hold a garage sale as soon as possible and sell as many items as you can that you will not need in your new home. Put the leftovers in your give away pile and deliver the items to local charities, churches or any group that can use them right away. Finally, pack all the items that are going to the new place and clearly label the boxes with the room it should be delivered to in the new house and the contents inside. When you have to find something later, you’ll appreciate that you took the time to label the boxes correctly. If at all possible, avoid putting things in storage, especially a storage facility associated with the moving company. Do your best to ensure all of the items you move to the new house are ready for immediate move-in. Sending your belongings to the mover’s storage facility incurs extra costs, increases the chances of losing boxes and causes a hassle later when it is time to retrieve your items. If you absolutely must put some of your items in storage, consider a storage unit that you can rent personally. But before you do, consider the fact that you will have to move your belongings twice, once to the storage unit and once to your home. Who wants to move things twice? Unless you are only moving a few minutes away, this step is important. The farther you move from your present home, the more time and effort it will take to move. So, plan your route ahead of time. Traveling with pets or small children can present a few more challenges than traveling alone. Map out kid-friendly/pet-friendly hotels, locate restaurants your family likes and determine a few stops for mini-breaks along your route. Decide what time you will leave and how long the trip will take. Allow plenty of time. You definitely need to arrive at your new home before the movers get there. No matter how prepared you are to move, something is sure not to go according to plan. Just relax and take it in stride. Work around the unplanned event or unexpected surprise in the best way you can. Don’t waste your energy on over-reacting. You need all your energy for moving. Relax, smile and look forward to stepping inside your brand new home when you arrive. While you can’t plan for everything or prevent every problem from happening during a move, you can reduce your stress with these handy hints. Homebuyers with continuously changing needs want flexibility and options with their new homes. Flex rooms are the answer. One of the latest hot trends in new home construction lawyer Vancouver, flex rooms offer just what the homeowner wants, flexibility. The magic with a flex room is due to its versatility and multiple uses. Some larger flex rooms work well as a home office and easily convert to a guest room for weekend visitors. Others serve as a nursery for a young family and once the children have moved into their “big kid” rooms, it easily transforms into a den, formal dining room or exercise room. With smaller flex rooms, the space might work well as a storage area, but once you’ve added that garage with storage loft to your backyard, the storage space opens up for a computer/homework station instead. Or perhaps you need a place to store all of your supplies and equipment for favorite family hobbies like baseball bats and gloves or golf clubs. Sometime in the future, you might convert this space into the small sewing room you’ve always wanted and move the sporting equipment elsewhere. The beauty of a flex room is that it can be anything you want it to be when you need it. It just takes a little imagination, creativity and planning. Keep in mind you can improve your space further by adding special features like built-in cabinets, shelving units, task lighting or extra electrical outlets which contribute to the usefulness and flexibility of the space. If you are looking for a home plan with flexible space and options as your family grows and changes, select a home plan with a flex room. Don’t forget to check out home plans with a bonus room. They can be used in much the same way. If you plan to work from home in your new home office, perhaps you’ll want it to a have a look that is a little more personal than your cubical or office at the corporate worksite. All it takes is a little creativity and you’ll have an office that inspires and motivates you while reflecting your personality. Consider these tips as you furnish and decorate your new home office. Stray from the humdrum of neutral colors you are used to in a typical office like beiges and grays. Incorporate a couple colors that pop like bright reds, blues and oranges or whatever your favorite colors might be. Include these colors in accent pieces such as the fabric of your office chair, an area rug, curtains or even an artistic pot for your favorite plant. Do away with typical plastic organizational items like bins and tubs. Incorporate more texture by using wooden trays and woven baskets. Opt for wicker baskets that slide into wooden cubbies to store files instead of a standard metal filing cabinet. Add texture and pattern to room painted with solid color walls. Back a bookshelf with patterned wallpaper or a favorite piece of fabric. Cover a coffee can with wrapping paper and use it to hold pencils and pens. A cork board is easily transformed into a functional piece of art by covering it with a fabric sample and adding a frame before hanging it on the wall. Replace ordinary drawer pulls and handles with a fun design or something painted in your favorite hue. Choose office furniture with a rich wood grain instead of that old metal office desk. If wood isn’t your thing, consider a steel framed desk with a glass top for a more retro look. Don’t forget lighting. Lamps and fixture come in such a wide range of styles, colors and sizes that it is easy to let your personality shine through with a carefully selected lamp and shade or mounted fixture. Just make sure the lighting you choose is functional too. If your office is going to be part of your new home it should show off who you are and more importantly, it should feel like it is part of your home instead of just another cubicle in an office building. Following these tips will help make your office part of your home and also provide a place in which you are comfortable, inspired and ready to work. 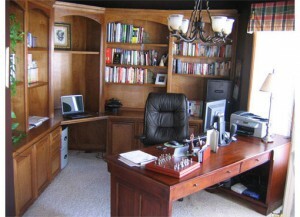 For more information about creating a personalized home office, check out Creating the Perfect Home Office Space. Are you looking for a weekend getaway that is as cozy as a cabin and as accommodating as a vacation home and has plenty of storage for all of your recreational vehicles and water toys? A carriage house is the answer. 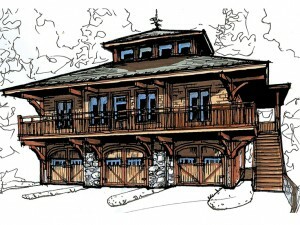 Perfect for your wooded lot or near your favorite lake, a carriage house can accommodate all of your needs. Generally two levels, the first floor offers a garage with lots of room for storage. Park the car or truck, ATVs and dirt bikes inside. You will also find it is easy to store a canoe, a couple of kayaks or the kids’ bikes. Garages with deep bays easily accommodate a boat. There are plenty of designs to choose from offering storage for one or more cars and providing more than enough room for all of the things you love. Some carriage houses even provide storage areas ideal for fishing poles, tackle boxes, life jackets and hunting gear, pleasing the outdoorsman in your family. Just right for long weekends with the kids or your neighbors, fishing with your pals or just getting away from it all, the living quarters of a carriage house offer all comforts of home in a compact floor plan. Typically, the living areas are situated on the second floor and are easily accessed from interior or exterior stairs. 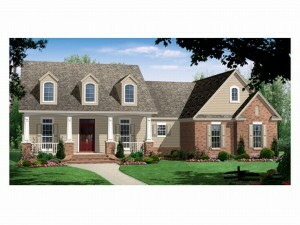 In most cases, the floor plan is open combining an efficient kitchen with the dining and gathering areas. Accommodations provide one or more bedrooms and baths. Some floor plans even provide a pantry, walk-in closets in the bedrooms and room for a washer/dryer unit. Occasionally, special extras are included like a private master bath, raised or vaulted ceilings and a fireplace. 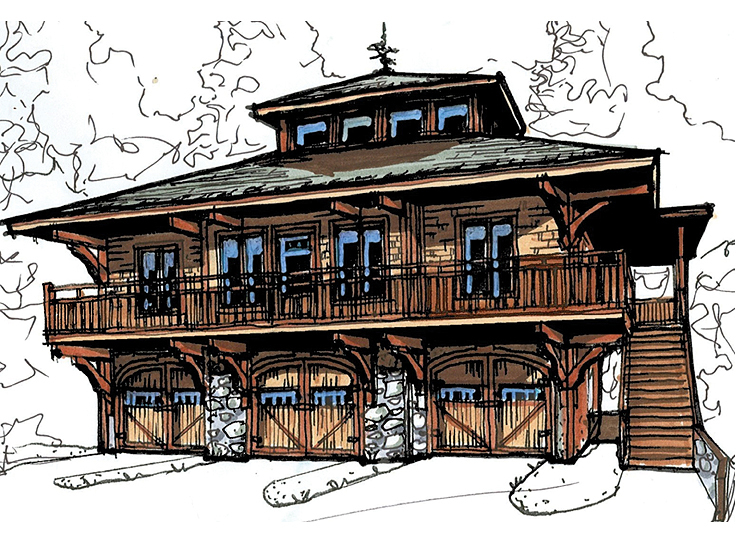 Though modest in size and design, a carriage house is just right for your home away from home.